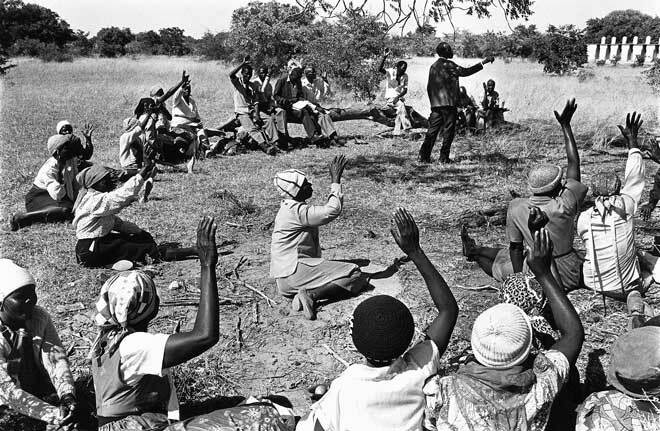 Voting takes place during a village meeting. 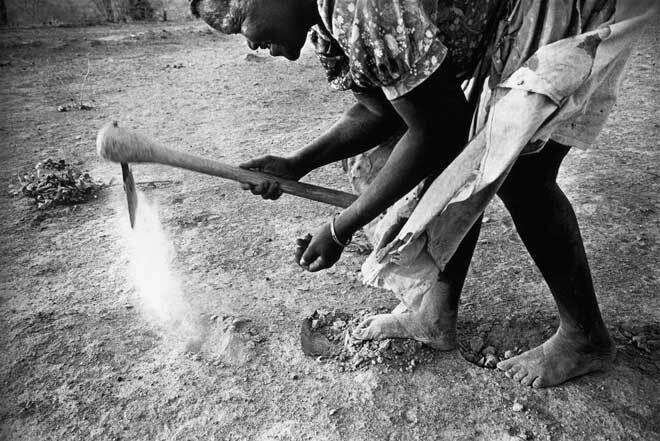 In the early 1990s, I made a few trips to Zimbabwe to document rural life and some of the development challenges that were being faced there. During this time I photographed the 1992 drought, which was then regarded as the worst drought in living memory. The drought transformed Zimbabwe from a position of food surplus into a net food importer within the space of a year. On one occasion, I joined a group of women as they walked over 6km to fetch water from a communal water hole. 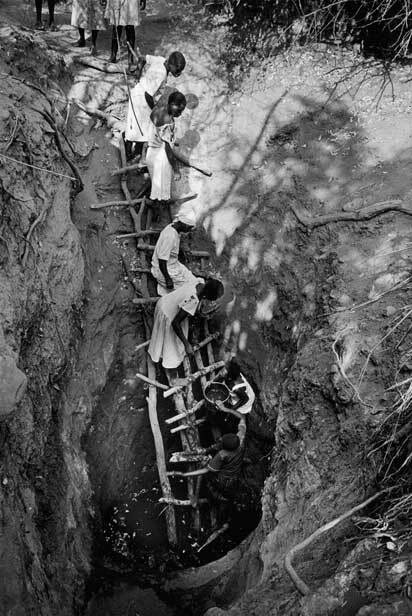 The water table had fallen so low that the women had to climb down a precarious wooden ladder towards a tiny pool deep in the ground. 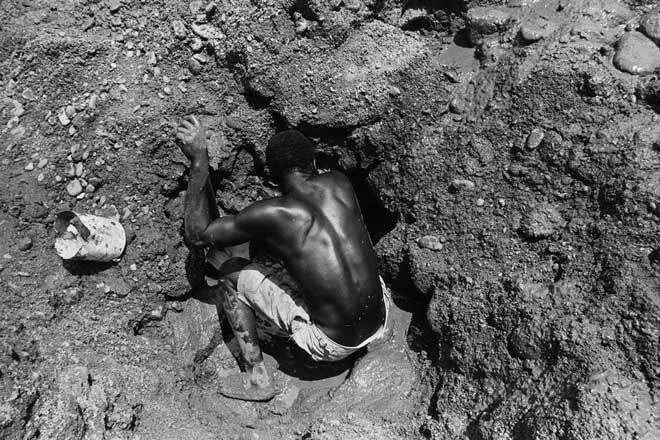 On another occasion, I photographed a group of farmers who had been forced to pan for gold illegally in the Lundi River, as they could no longer grow crops. The experience of photographing life under such extreme conditions brought home to me how deeply vulnerable Africa is to environmental degradation and climatic events. 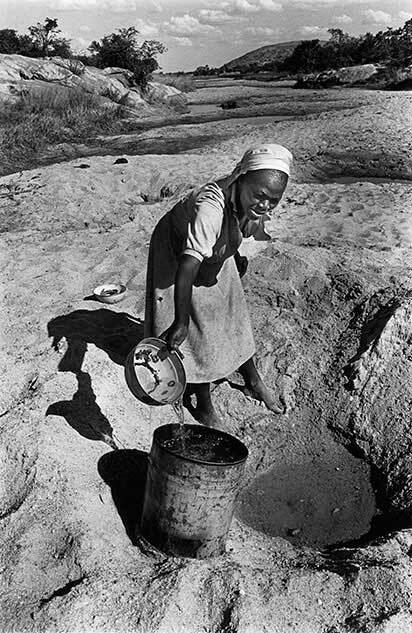 Mathilda Mathema digs in a dry riverbed to collect clean water for her family. A peasant farmer plows his parched field with hand tools. Instead of maize, he is now planting sorghum because it is more drought resistant. 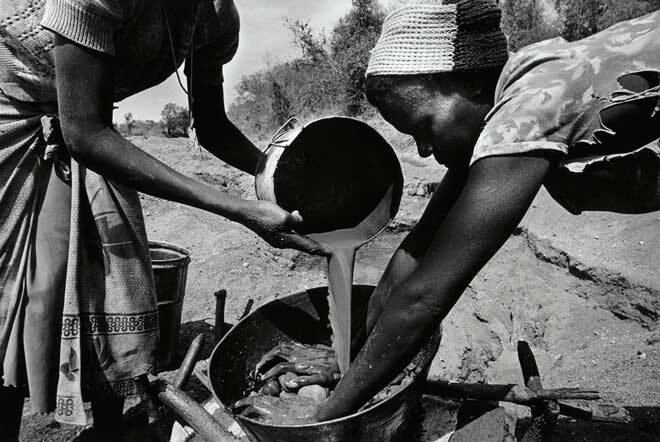 Drought has forced this Zimbabwean farmer to pan for gold in the Lundi River. Panning for gold in the Lundi River. 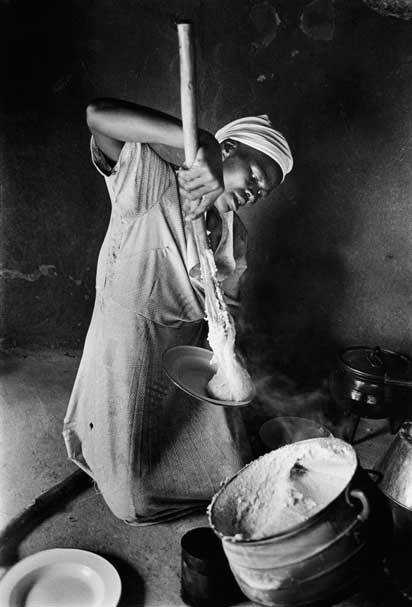 A woman prepares sadza, a traditional maize porridge. 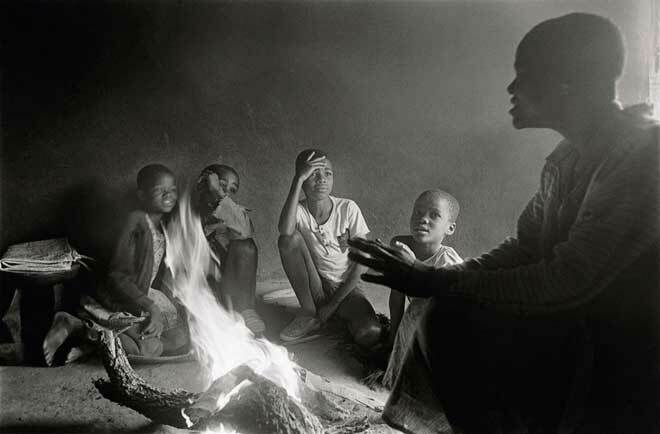 Children listen to stories by a fire. Villagers use a hand pump to draw water from the ground. 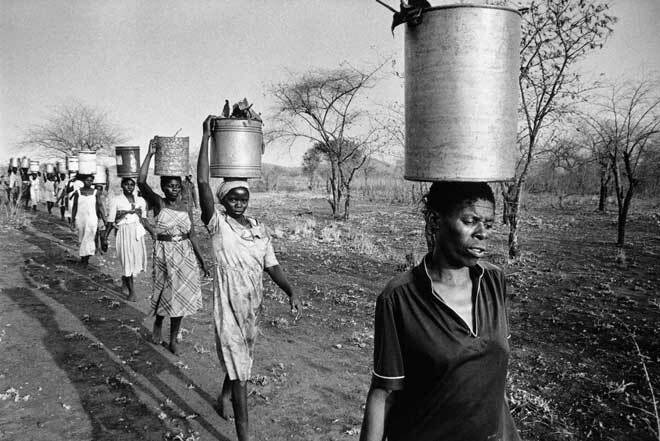 Women from the Zambezi Valley are forced to travel long distances to collect water, due to the falling water table. 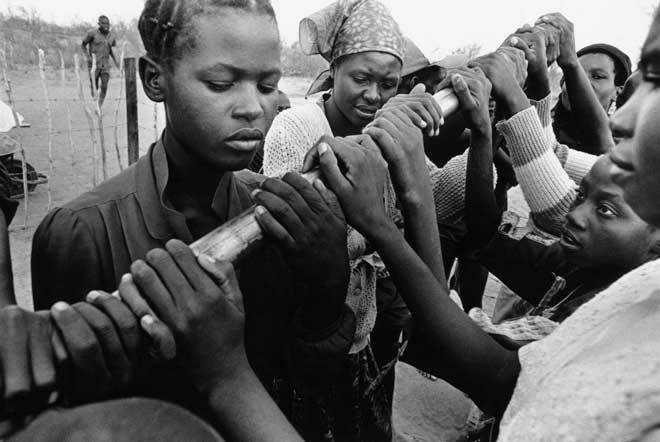 Villagers in the Zambezi Valley collect water from a communal water hole. The drought has forced them to deepen the hole in order to retrieve the diminishing water supply. On this occasion, not every woman was able to get her ration of one can, so the amount that was collected was redistributed. 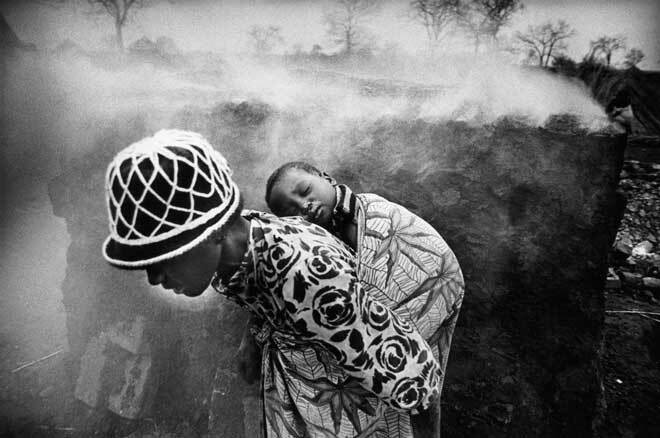 A Zimbabwean mother carries her child past a mud-brick kiln. This traditional kiln is used to make bricks for building houses. Mud is placed over the kiln to retain heat.